These are some cherries I picked off my cherry tree in my back yard. It is the first year that my little cherry tree produced lots of cherries. This is the third bowl of cherries I picked and it still has lots more to pick! :) They aren't very big, but they sure do taste good :) I love their red coloring! Another Dotee Doll I made. 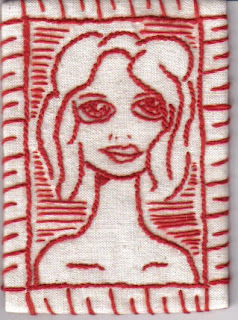 These are a couple of fabric ATCs I made. I didn't sew them on a machine, but added embroidery to them. The one on the left is for a one on one trade to a lady in the Netherlands. 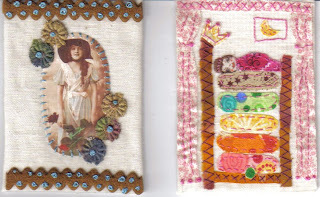 The one on the right is for a swap in the Stitched By Hand ATC group on flickr. The theme is fairy tales. I chose to do The Princess and the Pea. I collaged pieces of fabric and then added some embroidery stitches to them. I drew her face using micron pens, even then it wasn't easy to do. I still need to add the backs to them, so they aren't totally complete. This is my 2nd whimsy character I have made. I did make number three for my friend, but forgot to take a picture of it. These are really fun to make. I do enjoy needle felting. Wish I had more time to do more of it. 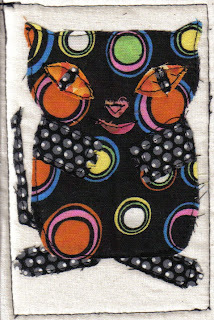 These are some recent ATCs I have painted. This is an altered box I made for my friend. It was my first altered box. It use to contain note cards and envelopes. I have to say that it was a little bit of a chellenge since I had to figure out how I wanted it to close. It took me two attempts to do the outside of the box. First I had painted it and distressed it, but wasn't very happy with it. So I altered that :) and did the outside finish that it has now. I was happy with how the inside turned out, and didn't make any real changes to it when I finished it.